Dictionary Learning Tools for Matlab. Karl Skretting, University of Stavanger. How to install and test the files. The Image Compressing Tools for Matlab web page. 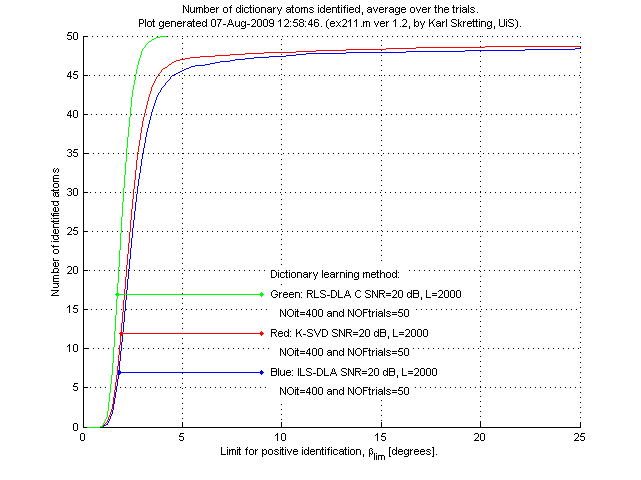 ILS-DLA, the Iterative Least Squares Dictionary Learning Algorithm by Engan et al. ILS-DLA includes Method of Optimized Directions (MOD). K-SVD, the K-SVD method for dictionary learning by Aharon et al. RLS-DLA, the Recursive Least Squares Dictionary Learning Algorithm paper by Skretting and Engan. ODL, the Online Dictionary Learning for Sparse Coding paper by Mairal et al. SPAMS, the page for the SPArse Modeling Software by Mairal. The Partial Search, paper presented at NORSIG 2003, by Skretting and Husøy. The ICASSP 2011 paper, "Image compression using learned dictionaries by RLS-DLA and compared with K-SVD" by Skretting and Engan. The SPIE 2011 paper, "Learned dictionaries for sparse image representation: Properties and results" by Skretting and Engan. The SCIA 2017 paper, "Sparse Approximation by Matching Pursuit using Shift-Invariant Dictionary" by Skretting and Engan. mpv2, The documentation for the Java package with files for Matching Pursuit and Dictionary Learning by Skretting. You may also see Skretting's PhD thesis for more on Dictionary (called Frame in the thesis) Learning. Michael Elad has done much research on Sparse Representations and Dictionary Learning, most of his publications are availabel online. I highly recommend Elad's (2010) book: "Sparse and Redundant Representations: From Theory to Applications in Signal and Image Processing"
where w is a vector containing the coefficients and most of the entries in w are zero. Dictionary Learning is the problem of finding a dictionary such that the approximations of many vectors, the training set, are as good as possible given a sparseness criterion on the coefficients, i.e. allowing only a small number of non-zero coefficients for each approximation. This page describes some experiments done on Dictionary Learning. The complete theory of dictionary learning is not told here, only a brief overview (of some parts) is given in section 3. and some links to relevant papers are included on the upper right part of this page. Section 4 presents the results of the experiments used in the RLS-DLA paper, and section 6 also includes the files needed to redo the experiments. In Matlab version 2012a Matching Pursuit algorithms are included in the wavelet toolbox, see Wavelet Toolbox User Guide. xa = D w, and the representation error can be written as : r = x - xa = x - D w.
If most of the entries in w are zero this is a sparse representation, the number of non-zero coefficients is s and the sparsness factor is s/N. As γ increases the solution is getting more dense. The problem with p=0 is NP-hard. Good, but not necessarily optimal, solutions can be found by matching pursuit algorithms, for example the order recursive matching pursuit (ORMP) algorithm. The problem with p=1 is easier, the LARS algorithm is effective for solving this problem. Both ORMP and LARS find w in a greedy way, starting with an all zero vector in w, which is the solution when γ is close to zero, then the algorithms add one and one vector based on some rules given by the algorithm. For the LARS algorithm this corresponds to all the solutions to Eq. 2.2 above with p=1 and γ gradually increases. For both ORMP and LARS there must be a stopping criterium, the algorithm returns when the stopping criterion is reached. This can be that the 0-norm (number of non-zeros) the 1-norm (sum of absolute values) or that the error (sum of squared errors) have reached a predefined limit. We should note that both LARS and ORMP implementations often are more effective when a fixed dictionary D can be used to find the solutions for several signal vectors at once. Matlab standard functions: pinv, \, linprog. pinv minimize 2-norm of the coefficients which is generally not sparse, linprog minimize 1-norm of the coefficients but is very slow. Thresholding can force sparseness onto the coefficients. Methods actually implemented in sparseapprox.m are FOCUSS, OMP orthogonal matching pursuit, ORMP order recursive matching pursuit and GMP global matching pursuit. If the mpv2 java package (by K. Skretting) is available then sparseapprox.m can be used to access some of the matching pursuit variants implemented there: javaMP, javaOMP, javaORMP and javaPS, the last one is partial search as described in the Partial Search paper. This paper also describes the details of and difference between OMP and ORMP. If the SPAMS software (by J. Mairal et al.) is installed and available from Matlab then sparseapprox.m can be used to access the mexLasso and mexOMP functions there. These implementations are extremly fast. There exist no standard naming for the matching pursuit variants, and mexOMP here returns exactly the same sparse approximations as javaORMP (and ORMP), but it is faster. A test of the sparseapprox.m function is done by ex300.m. The dictionary and the data in the mat-files included in the table at the bottom of this page is used and sparse approximations are found using several methods avaliable from sparseapprox.m. The results are presented in a table, parts of that table is shown here. Time is given in seconds (for the 4000 sparse approximations done), SNR is signal to noise ratio, w0 is average 0-norm for the coefficient, i.e. the first term in Eq. 2.2 with p=0, w1 is average 1-norm for the coefficient, i.e. the first term in Eq. 2.2 with p=1, and r2 is average 2-norm for the errors, i.e. the second term in Eq. 2.2. Here pinv, linprog and FOCUSS are followed by thresholding and the coefficients are adjusted by an orthogonal projection onto the column space of the seleceted columns. We can note that there is a pattern in the matching pursuit algorithms, as the error is decreased, from MP to OMP to ORMP to PS(10) to PS(250), the 1-norm of the coefficients is increased. The Shift Invariant Dictionary (SID) structure and the algorithm for sparse approximation using SID were both presented in the Scandinavian Conference on Image Analysis, Tromsø Norway, June 12-14 2017, paper available in proceedings part 1, page 362-373, or this link SCIA 2017 paper. In Matlab the SID can be in initialized by initSID.m, or initSID2D.m for the 2D case. The Matlab sparse approximation implementations use several m-files and one mex-file (I hope I got it all here). Some needed and helpful files are: For expanding the compact SID representation into sparse dictionary matrix you may use makeSIDmatrix.m and makeSID2Dmatrix.m. For matrix multiplication (using the compact SID representation) three functions are made multSID.m, multSIDt.m and multSID2D.m. The sparse approximation (Basic Matching Pursuit) is done by saSIDbmp2.m and it needs a mex-file for fast execution, saSIDbmp_mex.c. Orthogonal MP variants are available for both the 1D and the 2D variant, saSIDomp.m and saSID2Domp.m, both use sparseapprox.m to do the actual work. The Matlab function dlfun.m, attached in the end of this page, can be used for MOD, K-SVD, ODL or RLS-DLA. It is entirely coded in Matlab, except that the sparse approximation, done by sparseapprox.m, may call java or mex functions if this is specified. The help text of dlfun.m gives some examples for how to use it. Note that this function is slow as sparse approximation is done for only one vector each time, an improvement (in speed) would be to do all the sparse approximations in one function call for MOD and K-SVD, or to use a mini-batch approach like LS-DLA for ODL and RLS-DLA. However, processing one training vector at a time may give better control of the algorithm and gives more precise information in error messages and exception handling. Keeping W fixed find D using the least squares solution: D = (XWT)(WWT)-1 = BA-1. It is convenient to define the matrices B=XWT and A=WWT. Normalize D, i.e. scale each column vector (atom) of D to unit norm. Part 3 may be skipped if D is almost normalized and the l0-sparseness is used. Part 1 is computationally most demanding, and with this setup there will be a lot of computational effort between each dictionary update, slowing down the learning process. This is especially true with large training sets. Some minor adjustments can be done to improve the learning speed for large (and also medium sized) training sets, this variant can be denoted as the large-MOD variant. The training set is (randomly) divided into M (equal sized) subsets, the subsets are denoted Xm for m=1 to M. Now, for each iteration we only use one, some few, (or perhaps almost all) of the subsets of training vectors in part 1 above. Which subsets to use may be randomly chosen, or the subsets which has been unused for the longest time can be selected. 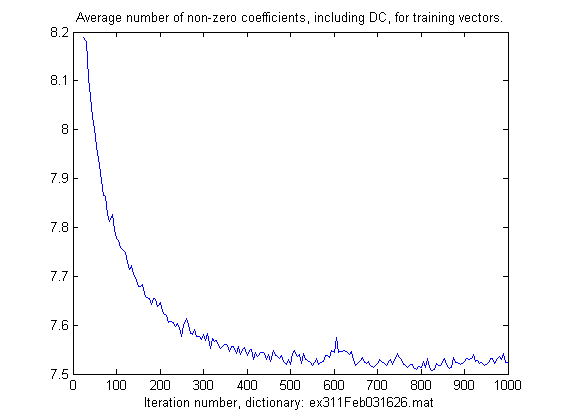 Anyway, finding new coefficients for only a part of the total number of training vectors reduces the time used. In part 2 the matrices A and B are calculated by adding products of training vector submatrices and coefficient submatrices, i.e. The sum can be taken over the same subsets that were used in part 1 of the same iteration. An alternative, that is especially useful in the end when the dictionary do not change very much from one iteration to the next, is to take the sum in part 2, Eq. 3.2, over all subsets in the training set even if only some of the coefficients were updated in part 1 for this iteration. Eq. 3.3 is indeed very flexible. If the used set of training vectors always is the complete finite training set, Xi = X, and λi = 0 it reduces to the original MOD equation. On the other end, having each training set as just one training vector, Xi = xi, and λi = 1, makes the equation mathematical equivalent to the RLS-DLA (section 3.4) without a forgetting factor and almost equivalent to the original ODL (section 3.3) formulation. The challenge when using only one training vector in each iteration is the often computationally demaning calculation of the dictionary in each step. Both ODL and RLS-DLA have alternative formulations to the least squares solution, Di = Bi Ai-1. Smaller subsets and the forgetting factor close to one makes the equation quite similar to the mini-batch approach of ODL, in fact it may be considered as a mini-batch extension of RLS-DLA. The code below is from ex210.m, see more of the dictionary learning context in that file. This is the very basic straight forward MOD implementation to the left. To the right is how my java implementation of MOD can be used. Keeping only non-zero positions in W fixed and find D and W using SVD decompositions. Dictionary normalization is not needed as the SVD make sure that the dictionary atoms are unit norm. We should note that using K-SVD with the l1-norm in sparse approximation, i.e. LARS, makes no sense since the K-SVD dictionary update step conserves the l0-norm but modifies the l1-norm of the coefficients, and thus the actual coefficients will be neither l0 nor l1 sparse. where dj, bj, aj are columns of the D, Bi, and Ai matrices and D here is the column by column transition of the dictionary from Di-1 to Di. Note that if Eq. 3.4 is repeated the dictionary will converge to the least squares solution, Di = Bi Ai-1, often after just some few iterations. For details see the ODL paper by Mairal et al. where u = (Ci-1 / λi) wi and α = 1 / (1 + wiT u) , and ri = xi - Di-1 wi is the representation error. Note that in these steps neither matrix inversion nor matrix by matrix multiplication is needed. The real advantage of RLS-DLA compared to MOD and K-SVD comes with the flexibility introduced by the forgetting factor λ. The Search-Then-Converge scheme is particular favorable, and the idea is to forget more quickly in the beginning then forget less as learning proceeds and we get more confidence in the quality of the dictionary. This can be done by starting with λ slightly smaller than one and slowly increasing λ towards 1 as learning progress. The update scheme and λ should be chosen so that the initial dictionary is soon forgotten and convergence is obtained in a reasonable amount of iterations. The effect of different values for λ and the Search-Then-Converge scheme is illustrated in section 4 below. The code below is from ex210.m, see more of the dictionary learning context in that file. To the left we just call another function, i.e. dictlearn_mb.m, which do the work. The only issue here is to set its parameters in an appropriate way. You should note that the variable n below use 500=25+50+125+300 to set the number of training vectors to be used in learning to the same as the number of vectors in the training set L times the number of iterations to do noIt. The function dictlearn_mb.m returns the results in a struct, the dictionary is field "D". To the right is how the java implementation of RLS-DLA can be used, here the work is done by jDicLea.rlsdla(...). The java implementation is more flexible when it comes to decide how the forgetting factor should increase towards 1, below a quadratic scheme is used. The experiments in the RLS-DLA paper showed that this flexibility is not needed, the choice used in the minibatch function will do. The experiments are made as Matlab m-files that run in the workspace, not as functions. The training set used for all experiments on the AR signal is stored as a matrix X in dataXforAR1.mat, dimension of X is 16x4000. This set is also used as the test set. The goal of dictionary learning here is to represent this particular data set in a good way, not to make a dictionary for a general AR(1) signal. The target (and test) sparseness factor is 1/4, which gives s=4 non-zero coefficients in each sparse representation. The first experiment, ex111.m, compare three methods to each other. 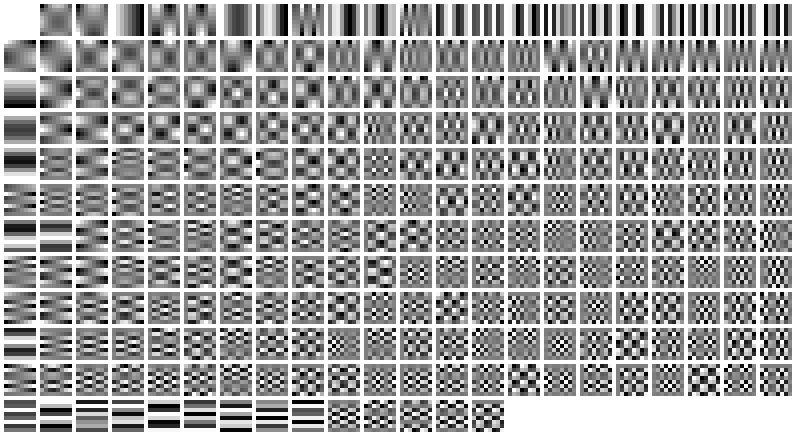 Only 200 iterations are done, to get better results thousands of iterations should be done as in ex112.m but those results are not shown here. RLS-DLA is used with λ set to one. Above is results for ex111.m. We see the results are not very good for the RLS-DLA method. K-SVD and ILS-DLA (MOD) perform very similar to each other. In the next experiment ex121.m RLS-DLA is used with different fixed values of λ. Above is results for ex121.m. We see that the RLS-DLA method here performs much better. 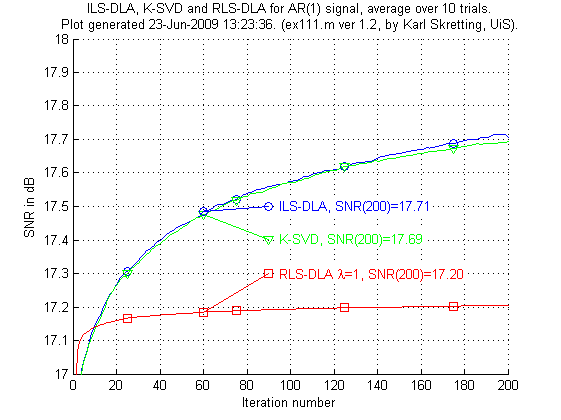 For appropriate values of λ RLS-DLA is better than K-SVD and ILS-DLA (MOD). 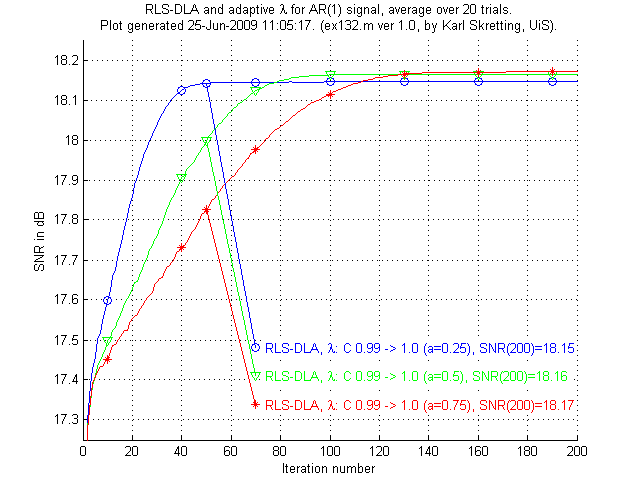 In the third experiment, ex131.m and ex132.m we will see that RLS-DLA can do even better when an adaptive scheme for λ is used. Above is results for ex132.m, results for ex131.m are not shown here. We see that the RLS-DLA method here performs even better. The convergence of the algorithm can be targeted to a given number of iterations. The variable a in the experiment gives when λ is increased to its final value 1, it is given as a fraction of the total number of iterations. 4.2 Recovery of a known dictionary. In this experiment we want to compare the different dictionary learning algorithms regarding recovering of a known dictionary. A true dictionary of size 20x50 is made in each trial. 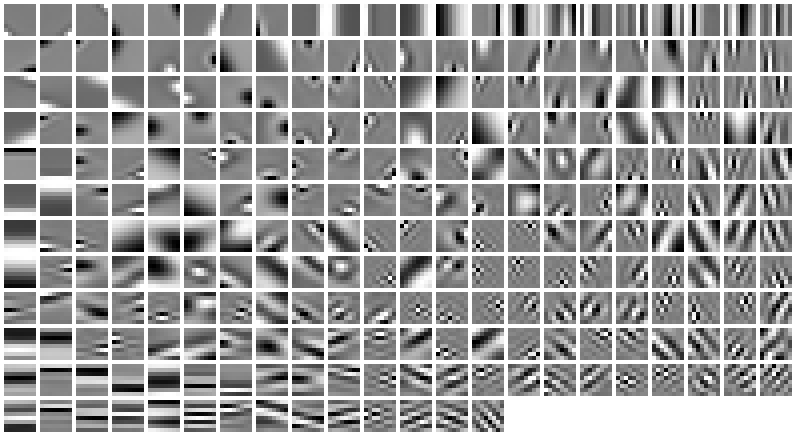 A set of training data is made by using the true dictionary, each training vector is a sparse combination of some, here 5, vectors from the true dictionary and random noise. The number of training vectors can be chosen and the level of noise can be given. Then a dictionary is trained from the training set using one of the three methods, ILS-DLA (MOD), K-SVD, and RLS-DLA. The trained dictionary is then compared to the true dictionary, this is done by pairing the dictionaries atoms in the best possible way and using the angle between a true atom and a trained atom as a distance measure. The number of identified atoms is then found by comparing these angles to a limit, βlim. Above is results for ex211.m. 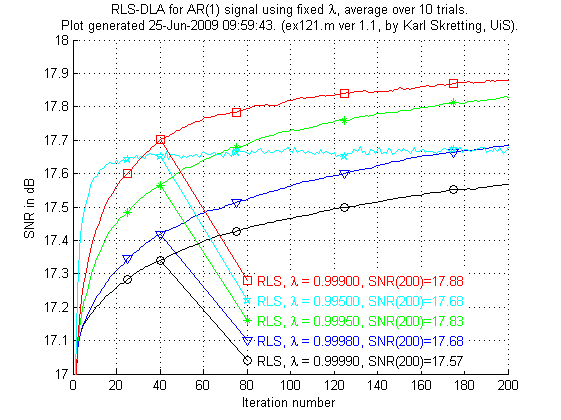 We see that the RLS-DLA method here performs better than ILS-DLA (MOD) and K-SVD which both perform quite similar. The most remarkable difference is that RLS-DLA is able to identify all atoms for a quite small angle βlim. ILS-DLA (MOD) and K-SVD always have some atoms that are far away from the true atom. Having βlim=8.11 degrees corresponds to the case where the inner product of the two compared atoms is equal to 0.99, each atom has 2-norm equal to 1. This section describes how to learn the dictionaries used in the image compression examples in our ICASSP 2011 paper. How the learned dictionaries were used is described in the image compression example in section 7 on the IC tools page where also the 8 used dictionaries are available, those dictionaries were designed by the m-files presented here. An important point in our ICASSP 2011 paper is that sparse approximation using a dictionary can be done in the coefficient domain, and that this improves compression performance in much the same way as using the 9/7 wavelet transform performs better than using the block dased discrete cosine transform (DCT). Thus, the learning must be done in the coefficient domain and the training vectors be in the coefficient domain. A Matlab function, getXfrom8images.m, was made to generate the training vectors from 8 training images (shown below). The function is actually quite flexible and can be used to generate training vectors from all images that can be read by the Matlab imread function. Training vectors can be made in the pixel domain or in several transform domains, most important the 9/7 wavelet domain. The function needs mycol2im.m from ICTools, which must be in the current directory or available on the Matlab search path. The getXfrom8images.m file should be updated so that its default image catalog matches a catalog on your computer where the 8 bmp-images above, i.e. elaine.bmp, lake.bmp, man.bmp, crowd.bmp, couple.bmp, woman1.bmp, woman2.bmp, baboon.bmp, are all stored. 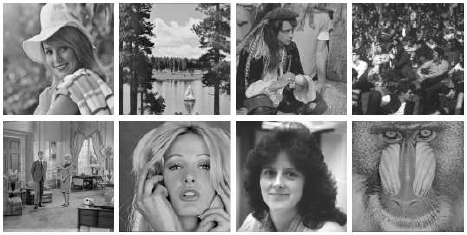 These images, as well as lena.bmp, are available in a zip-file, USCimages_bmp.zip. %   verbose     0 or 1, default 0. The returned variable res will be a struct with the leared dictionary as one field. It will also be stored in a mat-file in the current catalog. The 8 dictionaries learned for the image compression example in section 7 of the ICTools page were learned by these four implementations. The m-file ex31prop.m can be used to display some properties of these dictionaries, and other dictionaries learned by the four m-files ex31?.m. ex31prop display properties for 8 dictionary files. The result off the commands above is plotted below. This section starts with a brief presentation of some dictionary properties. Many of these properties are used in the experiments done in the SPIE paper, they are used to assess learned dictionaries and to compare dictionaries to each other. The larger part of this section describes two of the three experiments done in the SPIE paper. 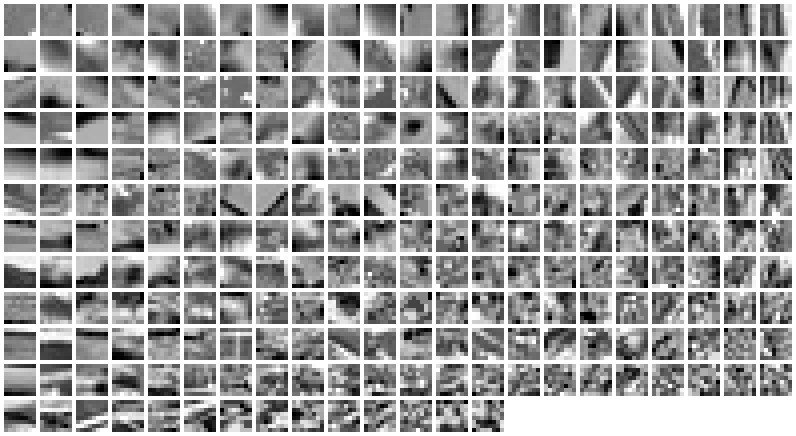 The main purpose of these experiments were to compare different learning algorithms to each other, including the effect of using either the l0-norm (ORMP) or l1-norm (LARS) in vector selction, for sparse approximation of patches from natural images. The Matlab files and how to use them are briefly explained. Some results are presented, including plots of some of the learned dictionaries. A thorough presentation of many dictionary properties is given in Elad's book: "Sparse and Redundant Representations ...". Also the SPIE 2011 paper gives an overview of some dictionary properties, mainly those that are relatively easy to compute. It also suggests some new properties, i.e. μmse, μavg, βmse, and βavg, and proposes a measure for the distance between two dictionaries: β(D,D'). The table below lists some properties for a normalized dictionary, i.e. each atom (column vector) has unit 2-norm. The dictionary is represented as a matrix D of size NxK. For more details on each property see the SPIE paper. μ, βmin Coherence and angle between the two dictionary atoms closest to each other, coherence is cosine of the angle. For a normalized dictionary the coherence is the inner product of the two closest atoms. μavg, βavg Average of cosine (angle) for all atoms to its closest neighbor. including an atom to itself. These properties can be computed from the eigenvalues. μgap, βgap Cosine (angle) for the most difficult vector x to represent by one atom and its closest neighbor in the dictionary. This property is generally hard to compute. β(D,D') Distance between two dictionaries as the average angle between each atom (in both dictionaries) to its closest atom in the other dictionary. SRC The Sparse Representation Capability is the average number of atoms used in a sparse approximation of a set of test vectors where the representation error is below a given limit for each test vector. The following table shows some example dictionaries. The dictionaries listed in the table are available as mat-files, links are given in third column. Some dictionary atoms are shown in the second column of the table, all atoms should be shown when you click on these. The six rightmost columns are properties found for each dictionary. The fourth dictionary is the concatenation of 4 maximally separated orthogonal bases, it is made by the get64x256.m function. The dictionary in the table includes the identity basis, and the SRC measure is 10.87. If we rotate all atoms such that the 2D-DCT basis is in the dictionary (instead of the identity basis) then we get a dictionary with the same properties but which will achieve better SRC measure, SRC = 10.38. Using only the dct basis will give SRC = 13.55. The fifth dictionary is made by the get64x256sine.m function which needs the getNxKsine.m function. The last dictionary is an ad-hoc dictionary with 168 separable sine atoms, and the rest of the atoms are 6x6 2D-dct basis functions multiplied by a window-function and located in the corner of each patch. Varying targetPSNR and lambda0 it should be possible to make dictionaries similar to the ones described in the SPIE paper, and present the results in a similar way. We observed that the resulting dictionary properties mainly depended on the selected parameters. Learning several dictionaries with the same parameters, but different initial dictionary and different training vectors, all had almost the same properties. This is a good property of the learning algorithm, as it seems to capture the statistical properties of the training set rather than depending on the specific data used. We also noted an essential difference between dictionaries learned by LARS (l1-sparsity) and dictionaries learned by ORMP (l0-sparsity), see results presented in the SPIE paper. In experiment 2 we again refer to the SPIE paper for a more complete description of the experiment and a presenteation of the results. This section presents the Matlab files and some additional results. First we review the main results as presented in Table 3 in the SPIE paper. The 8 different (variants of) dictionary learning algorithms used in this experiments are implemented by 4 m-files. The MOD dictionaries, case 1 and 3, were generated by testDL_MOD.m. The K-SVD dictionaries, case 2, were generated by testDL_KSVD.m. These two functions assume that there is available a fixed huge set (1 million vectors) of training vectors in 50 files (20000 training vectors in each) in a catalog on the local computer. But if these files are not available the functions will make a new set of training data in each iteration. The advantage with a fixed, but huge, training set is that learning has a fixed training set, which is an assumption made when the algorithms are derived. But even with this huge training set, in each iteration only some few (1 to 10 randomly chosen) subsets of the 50 available subsets are used, and this way the 'fixed training set in each iteration' assumption is violated. The dictionaries for the first three cases can be made by the Matlab commands below, the results can be displayed by testDLplot.m function. The dictionaries in case 4 were made by the ex414.m m-file used in experiment 1, but with different parameters. The last 4 cases were all made by the ex413.m m-file, this is a function and may be called with several parameters to select which variant of ODL or LS-DLA to run. The two different methods were implemented by the same function since the implementation should ensure that the two methods, ODL and LS-DLA, can be run under exactly the same conditions. It should be possible for both methods to use excactly the same scheme for the forgetting factor and for the mini-batch approach, the only difference is the few code lines where the actual dictionary update is done. ODL uses the equation 3.4 in section 3.3 above, while LS-DLA uses the equation 3.3 in section 3.1 above. The LS-DLA scheme is actually how we would implement a mini-batch variant of RLS-DLA. We see that the true RLS-DLA implementation in case 4 and the mini-batch implementation in case 5 give dictionaries with the same properties. The dictionaries for the last five cases can be made by the Matlab commands below, the results can be displayed by testDLplot.m function. The distance between two dictionaries, β(D,D') in Table 3 in SPIE paper, shows that dictionaries learned by the same method are in fact quite different from another, even though their properties are almost the same. The variance (or standard deviation) is relatively small for all values in Table 3, also for the β(D,D') measure. That means that if two dictionaries are learnt by the same method, and the same parameter set, the expected distance between them will be expected to be as given in Table 3, standard deviation will be less than 1 degree. We can also measure the distance between dictionaries from different cases and present the results in a table, the column in Table 3 in the SPIE paper is the diagonal in this table. We note that the thre cases 4, 5 and 6 are almost equal to each other, especially 4 and 5. Also case 3 and case 7 are quite equal to each other, these numbers are shown bold in the table. This table also hows that dictionaries for case 8 are quite special, they are different from the other cases and also more clustered, i.e. more equal to each other in the β(D,D') measure. For experiment 3 we just refer to the SPIE paper. The experiments are done in Matlab supported by Java. The Java package mpv2 is a collection of all the Java classes used here. mpv2 stands for Matrix Package version 2 (or Matching Pursuit version 2). Note that mpv2 is compiled for Java 1.5 and do not work with older Java Virtual Machines (JVM), upgrading JVM in Matlab is possible, see Mathworks support. mpv2 has classes for Matching Pursuit based vector selection algorithms and for Dictionary Learning Algorithms. The ILS-DLA (MOD) and RLS-DLA methods are implemented in this package. As the classes for MP and DLA use matrices extensively, effective Java implementations of some matrix operations were also needed. This was done by including the classes from the JAMA-matrix package and wrapping an abstract matrix class AllMatrices around the implementations of different kind of matrices, including the JAMA-matrix class. The mpv2 package works well, and I think that parts of the package are well designed and easy to use. But the mpv2 package must still be regarded to be incomplete and under development. To use the mpv2 Java package from Matlab you need to copy the class-files from mpv2-class.zip into a catalog available from a Java Path in Matlab. For example you may copy the unzipped class-files into the catalog F:/matlab/javaclasses/mpv2/, and make the catalog F:/matlab/javaclasses/ available in Matlab as a DYNAMIC JAVA PATH (see Matlab javaclasspath). Documentation is in mpv2. Java files, i.e. source code, for most classes in the mpv2 package are in mpv2-java.zip. I consider the left out classes, DictionaryLearning and MatchingPursuit, to be of less general interest. If you want to run these experiments you should make a catalog in Matlab where you put all Matlab-files from the table below. To test that the files are properly installed you start Matlab and go to the catalog where the files are installed. In the Matlab command window type help lambdafun to display some simple help text, then go on and type lambdafun('col'); to run the function and make a plot. The file java_access check that the access to the mpv2 Java package is ok. You should probably edit this m-file to match the catalog where mpv2 is installed. When Java access is ok you may run bestAR1. This file uses the ORMP algorithm (javaORMP) to do a sparse representation of the AR(1) training set using a predesigned dictionary. bestDforAR1.mat The mat-file which store the best dictionary for the AR(1) data. dataXforAR1.mat The mat-file which store the training, and test, data set. Size is 16x4000. dict_sine.mat 5 example dictionaries used in section 5.2 above. ex414_Jun250624.mat An example dictionary made by ex414.m, see section 5.2 above. testDLdataA.mat The mat-file with data used for the SRC-measure in section 5.2 above. Size is 64x25600. bestAR1.m Load and test the best (found so far and using ORMP with s=4) dictionary for the special set of AR(1) data, i.e. bestDforAR1.mat. datamake.m Generate a random data set using a given dictionary. dictdiff.m Return a measure for the distance between two dictionaries. dictlearn_mb.m Learn a dictionary by a minibatch RLS-DLA variant. dictmake.m Make a random dictionary, iid Gaussian or uniform entries. dictnormalize.m Normalize and arrange the vectors of a dictionary (frame). dictprop.m Return properties for a normalized dictionary (frame). dictshow.m Show atoms, basis images, for a dictionary or a transform. Needs mycol2im.m from ICTools. dlfun.m A slow Matlab only Dictionary Learning function, can be used for MOD, K-SVD, ODL or RLS. ex111.m, ex112.m m-files for first experiment presented in section 4.1 here. ex121.m m-file for second experiment presented in section 4.1 here. ex131.m, ex132.m m-files for third experiment presented in section 4.1 here. ex210.m, ex211.m m-files for generating data and displaying results for experiment presented in section 4.2 here. ex210.m is extended with more learning alternatives April 2013.
ex300.m m-file that tests sparseapprox.m, using the mat-files above. ex313.m, ex315.m Dictionary learning for images, section 5.1 above. The metods are ILS-DLA (MOD), RLS-DLA, K-SVD and separable MOD. ex31prop.m Display some properties for dictionaries stored in ex31*.mat files. ex413.m, ex414.m Dictionary learning for (BSDS) images, section 5.2 above. getNxK.m Get a NxK dictionary (frame) with small coherence, use L-BFGS. getNxKsine.m Get a NxK dictionary (frame) with or without sine elements. For the case without sine elements a small coherence dictionary is returned. get8x21haar.m Get an 8x21 regular Haar dictionary (frame), used in ex315.m. get8x21sine.m Get an 8x21 dictionary (frame) with sine elements, used in ex315.m. get16x144.m Get a 16x144 tight dictionary (frame). get64x256.m, get64xK.m Get a 64x256, or a 64xK, tight dictionary (frame). get64x256sine.m Get a 64x256, i.e. 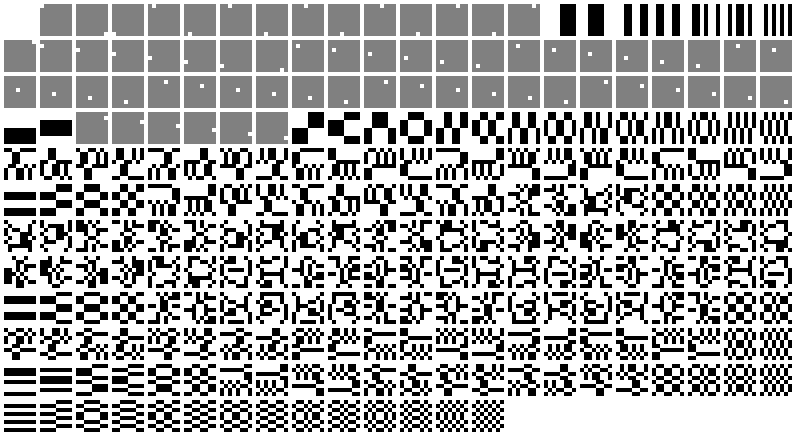 (8x8)x(16x16), separable dictionary with sine elements. getXfrom8images.m Get (training) vectors generated from 8 example images. getXfromBSDS300.m Get (training) vectors generated from images copied from the Berkeley image segmentation set. lambdafun.m Can be used to set the forgetting factor λ in RLS-DLA. idxSIDmap.m Index map between SID dictionaries of different size. initSID.m Initialize Shift Invariant Dictionary given atom lengths and shifts. and the two dimensional case y = D*w.
plotSID.m Visualize Shift Invariant Dictionary. saSIDbmp2.m Sparse Approximation using Shift Invariant Dictionary (SID) and Matching Pursuit (MP). saSIDomp.m, saSID2Domp.m 1D and 2D variants of Orthogonal MP using Shift Invariant Dictionary. and a special varint for plotting (showing) dictionary properties. 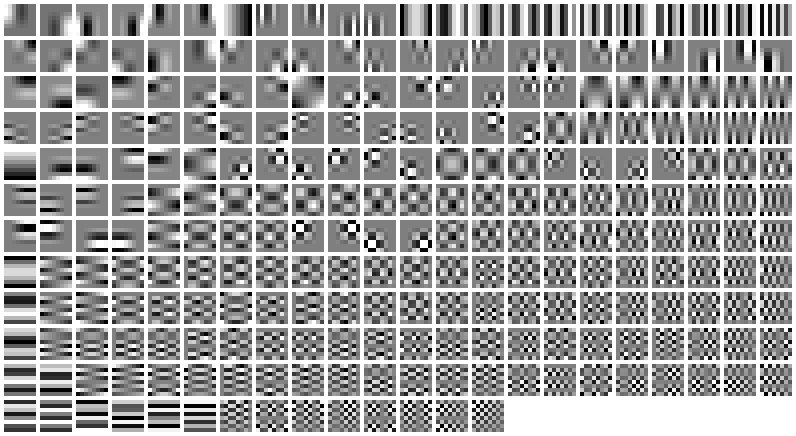 assignmentoptimal.m Compute optimal assignment by Munkres algorithm (by Markus Buehren). java_access.m Check, and try to establish, access to mpv2 java-package. and perhaps also use a m-file like below to return the relevant path. 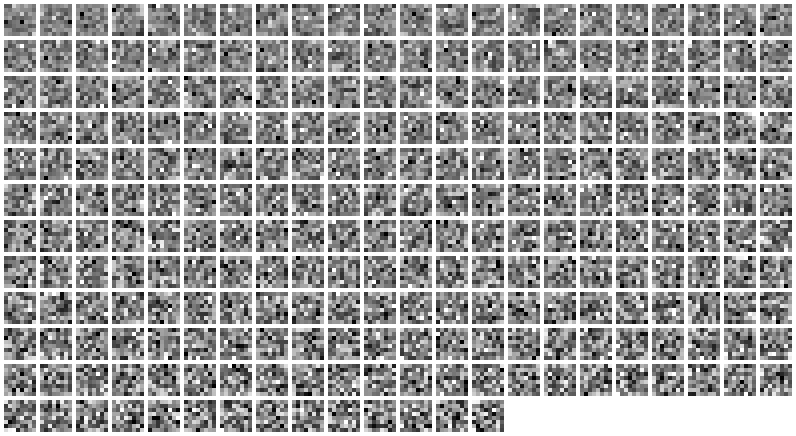 munkres.m Compute optimal assignment by Munkres algorithm (by Yi Cao), faster than assignmentoptimal.m. my_matlab_path.m Return the relevant path for (some of) my matlab catalogs. saSIDbmp_mex.mexw64 Sparse approximation using Shift Invariant Dictionary (SID) and method Basic Matching Pursuit. and compiled for Matlab in Windows 64 bit. sparseapprox.m Returns coefficients in a sparse approximation of each column in a matrix X.
sparse_xcorr_mex.mexw64 Sparse xcorr variant implemented directly in time domain (not via FFT). mpv2-class.zip The class-files for the mpv2 Java package. mpv2-java.zip The java-files for most of the classes in the mpv2 Java package. USCimages_bmp.zip Some images stored as bmp files, once copied from the University of Southern California-SIPI image database. The directory where these are stored should be written into the getXfrom8images.m file. Last update: April 19, 2018. Karl Skretting Visit my home page.